I started off so well. I had posts scheduled and planned and I loved that each day had it’s own little theme…Then the Mister got sick and the kiddos got sick and I had the weirdest random episode that had me on a combination of medicines that kept me awake but made me sleepy and crabby. Add a giant recipe/cooking fail for today with no backup plan and we’ve had a couple of nights picking up food, making sandwiches, and just accepting that life isn’t ever going to go as planned which means I don’t have a meal made especially for this post. I DO however have a recipe for a great seafood dipping sauce that is a holiday staple in my husband’s family. (No pretty picture though) It’s especially wonderful with oysters or shrimp. Note: I am not at all a fan of miracle whip or horseradish or even cocktail sauce but something about them all together is so good. I LOVE this dipping sauce. Don’t hesitate to play with the amounts to get it to your taste. If you could invite anyone to dinner (alive or dead) who would you choose? What would you want to talk to them about? When it comes to meal planning, I (obviously) don’t have it all figured out. But one thing that really does work for me is the planning notebook. 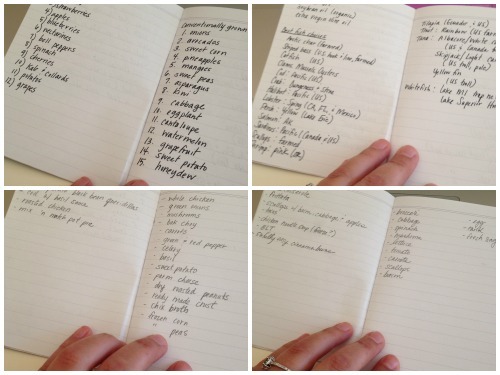 It’s just a small little notebook that I can easily throw in my purse but in it: I have the list of foods to always buy organic, smart and sustainable fish choices for my area, as well as the week’s meal plan and the items I need to make those meals. I don’t ever write out a full grocery list because I’m lazy and I like to pick up things (like fruit) when it looks good and it’s on sale. It’s a less than a dollar purchase that has made my life so much easier because I’m not scrounging for a loose piece of paper floating around in my bag or worrying about whether or not I should spend the extra money on organic berries (yes, I should) or onions (not necessarily). I highly recommend one.